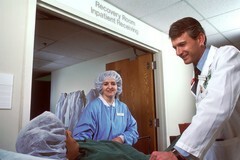 A Caucasian woman on a gurney just outside the surgery recovery room. A Caucasian physician and a nurse are on either side of the stretcher, either talking with her or pushing the gurney. The photograph was taken at lower than eye level.